Engineer Brett Hobson and Research Specialist Chris Preston on their way to launch the AUV containing a new genomic sensor. 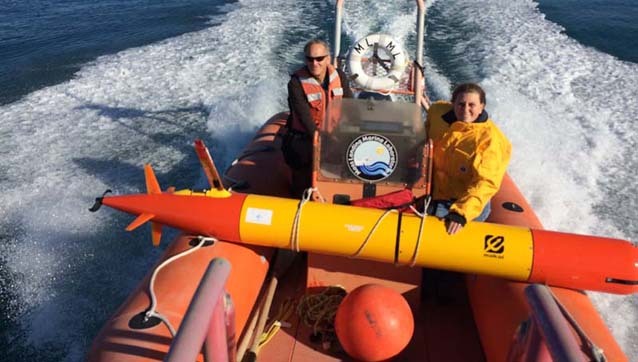 Jan 4, 2016 - The new, smaller version of the Environmental Sample Processor made its debut flight in the payload of a long-range-autonomous underwater vehicle. Six moored instrument arrays have been installed over Monterey Canyon for a large experiment to track underwater avalanches. Part of MBARI’s mission is to share our cutting-edge tools and technologies with researchers around the world. MBARI engineers are modifying this autonomous underwater vehicle to capture high-definition video marine biologists can use to discover and catalog midwater animals. Another way to share our developments and discoveries is through publication and presentations to industry groups.